Markets: Last week was a tough week for markets. Investors took a cautious approach as they waited for details on a possible trade agreement between China and the U.S. Trade remains in the picture but the week was also noteworthy for a series of poor data releases. This escalated concerns about a global economic slowdown. Eurozone government bond yields fell sharply on the back of the European Central Bank's (ECB) announcement last Thursday (see below). Chinese Data: China lowered its 2019 goal for economic expansion to a range of 6% to 6.5%. Weak trade data increased concerns about a global economic downturn. US Data: The U.S. trade deficit widened in 2018 - a 10-year high. The economy also added just 20,000 jobs in the last month. This marked February 2019 as the weakest month of jobs' creation since September 2017. Economists had expected a gain of 180,000. OECD Growth Forecasts: The OECD cut forecasts again for the global economy in 2019 and 2020. It warned that trade disputes and uncertainty over Brexit would hit world commerce and businesses. Eurozone Data: The ECB cut its euro-area growth forecast to 1.1 % this year from 1.7 % just three months ago and announced a fresh round of monetary stimulus. The surprise announcement left many fearing the worst for the global economy. President Mario Draghi announced a fresh round of loans to boost lending in Eurozone banks and hopefully, stimulate the real economy. Draghi also said that interest rates will continue to remain at current levels for at least until the end of the year. Oil: Prices slipped as bullish output forecasts by two big U.S. producers and a build in weekly U.S. crude stockpiles outweighed ongoing OPEC-led production cuts and U.S. sanctions against exporters Venezuela and Iran. Brexit: Reports from Brussels continue to suggest very little progress on talks between the UK and the EU ahead of a second parliamentary vote on Tuesday. The Chart of the Week shows German & Italian 10 Year Bond Yields over the last week. The green circle on the chart highlights the time of Draghi’s announcement last Thursday. Eurozone government bond yields fell across the board after the European Central Bank slashed its inflation and growth forecasts. The 10-year German government bond yield slipped 5.9 basis points to 0.069%, while the 10-year Italian bond yield plunged 14.5 basis points to 2.477%. 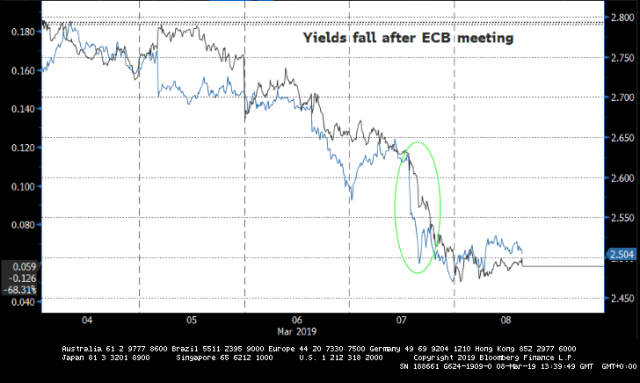 Analysts said investors weren’t expecting changes to the ECB's language on the timing of the next rate hike at the March meeting. Hence the surprise announcement sending yields for Eurozone govenment bonds lower.